Money naturally has a flow to it. It moves from one institution to another. It flows from one person to another. In order for a country, bank, charity, church, company, or family to be healthy financially, money needs to flow both in and out. Problems arise, however, when money ceases to flow. When a country tightens down on the money supply, when banks don't lend as freely as they once did, when people stuff money under mattresses, everybody suffers. Companies receive less revenue leading to a slow down in production which leads to layoffs. People out of work have less money to purchase goods and services. Governments receive less tax revenue. The entire process becomes a vicious cycle that can be difficult to break out of. 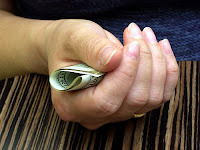 Live life with an "open hand"
In Financial Peace University, Dave Ramsey uses the analogy of the closed fist when it comes to the flow of money. When we hold our money with a tight fist, nothing can go out. Our money may be protected, but unfortunately, no new money can flow back into our hand. Our financial situation will be healthier if we will live life with an open hand. If we would just get beyond the hoarding, the "can all I get" mentality, and live a life of generosity. Not only will our finances be healthier if we live life with an open hand, but also our personal and spiritual lives will be healthier. Have you ever noticed that those who are stingy and hoard what God has given them are just not very pleasant to be around? Conversely, have you noticed that those who live a generous life are pleasant, healthy individuals? The flow of money in and out of our lives is the key to a healthy, joyful, prosperous life. A generous man will prosper; he who refreshes others will himself be refreshed (Proverbs 11:24-25). So, how's your money flowing during these uncertain economic times? Are you living life with an open hand or a closed fist? Dave is right on. I feel that most Americans have so much debt and are caught up so much in materialism that giving is something they do too little of. This would explain why only 2.6% of Christians tithe. Keeping money and not allowing it to circulate it won't give you financial freedom. When you give money it automatically flows in a circle and comes back to you. You have explained this idea very nicely.